I’m hoping for an AFL theme this week. Too much other stuff got in the way of my giving this week’s a good go. I think I missed out (of the ones I did do, ODDER I quite enjoyed). There’s a theme, but it is only very tangentially related to AFL. 9A is my favourite so far. Still a few to go, mostly in the lower left corner. Hrumph, I’m sure 18A is not an Aussie expression. Otherwise good fun, enjoyed over a glass or two of Penfolds red. I have all but the middle one. 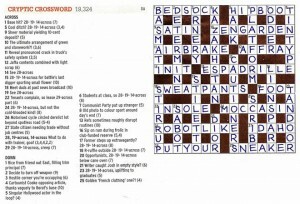 Favourite (in a puzzle with not many laughs) was definitely 9A. My unfavourite was 9A. Favourite was prob 16D. Some lovely devious clueing. 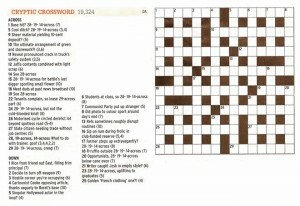 A thoroughly enjoyable crossword. Peter, I think you’ll find Bonds and many other manufacturers make 18A and that they are advertised in catalogues from Target and other stores. Yes, I mostly enjoyed it. Found the SE corner hard going. My favourites were 17D, 25D, 9A. I felt the same way as Peter about 18A. All OK, I thought, with a couple of whinges over in other thread. 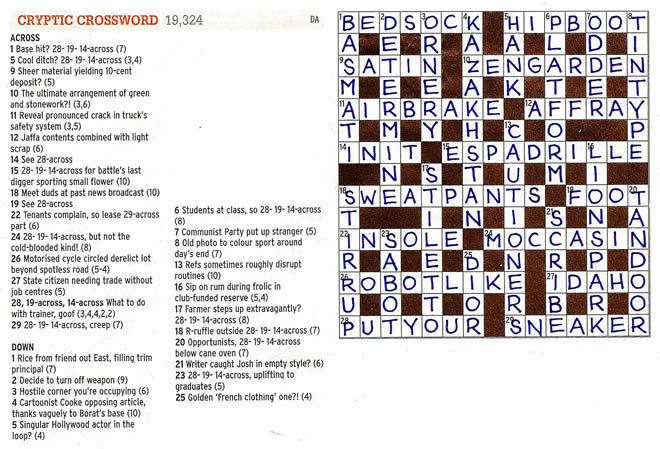 I was OK with 18A – it’s a usage I’ve heard over the last few years. , but can’t complain about DA’s use. Strange spacing in previous post was due to a faux-html joke being taken literally by humourless wordpress. 1/4 Is this an April fool’s day joke? Just to confuse us totally? The corner for this week’s not set up yet – and I’ve got half done before breakfast. Good one so far – and a couple of funnies. Yep Gail. Flight to Bris sees it all done. I esp liked 5D. I’m obviously in the wrong state of mind. 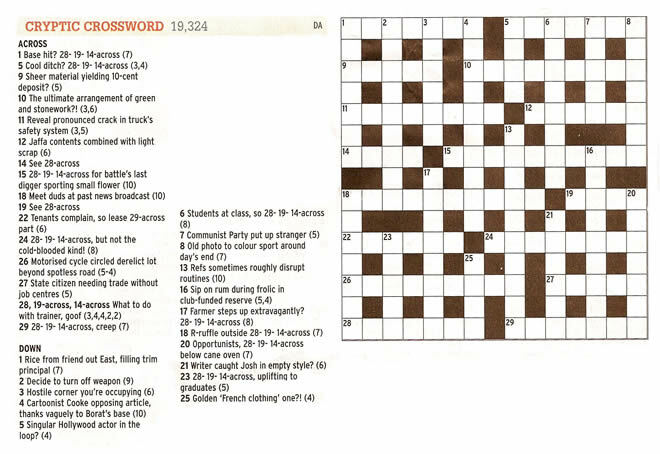 I got crushed by Enigmatist in Wednesday’s Guardian (I got two answers), and now I’m struggling on what appears to be a relatively easy DA.